A lot of peeps have told me that I need my own site or something to just post my thoughts and criticisms, as well as have some form of portfolio. I also need a better job than what I have, and my skillset could use some front-end experience. So, adding the two together, I decided to take this course. 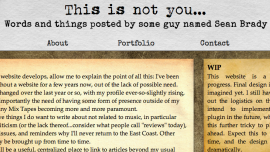 The url for this site is thisisnotyou.net/project. Update: Code challenge 1 completed. Project will be in the directory /project/ off the main domain. Update 2: Code challenge 2 completed. Many adjustments made to complete challenge, those these changes are more to exemplify merit than part of the future design. Changes will likely be removed as the page evolves. Replaced table in Portfolio page with semantics-based layout. This will serve as the foundation of the page's design development, thus justifying the change. Replace embedded video on About page with the actual video file itself. May revert to embed in future updates (video code seems to crash on my computer). Directory for media remains "images," though I may rename it to "media" for simplicity's sake in later iterations. Did not include map embed. While I understand the purpose, as the last code challenge showed, I prove able to embed properly, and I cannot justify embedding a map onto my site at this time. Update 4 (Evening, 1/29/13): Code challenges 4 and 5 completed. Site looks presentable now. Many of the things I needed to learn, mostly complete (save some advanced techniques). Design-wise...I could use a little guidance, so I'm bringing this up publicly to move forward. Also, adding cover photo for the sake of having a cover photo. Changed body background into something darker, and side bar background into something similar to the main content. Link button design changed. Replaced dotted borders with transparencies (save on 320 rez phones, which now has a complete border). 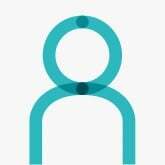 Hover switched from gradient to border outline, clicking on link uses a partially transparent background instead of a gradient. Bottom border added to header section. Could not justify a shadow. That is all for now. Feel free to let me know any suggestions that would make things look better. Finally figured out the problem with h2 on Firefox: Browser assumes any h2 is considered bold unless told otherwise. Changed font code so that it did not thicken on Firefox. After finally seeing the site on an actual smartphone (or two), made adjustments to media queries, including header static position and stretched image on header background, and fixing font size on smaller than 480 rez screens (to 60%). Added PHP to the contact sheet for a wrong captcha. Set img height to auto, which fixes stretching problems on Safari and mobile browsers. Brightened the body background a bit. It looked too dark. Barring fixing the mailer PHP (or just implementing my own mailer PHP), this is mostly done as a proof of concept. Watch the site in the coming weeks, as I implement a CMS, work other things out, and make this a true site that'll go live, hopefully by March.